This is the first of a number of player previews heading into the Washington Capitals‘ 2015-16 season. Washington general manager Brian MacLellan certainly bulked up on offensively skilled players this offseason, mainly Justin Williams and T.J. Oshie. With much of their forwards earning significant salary in the upcoming campaign, a substantial part of the Capitals’ success this season will hinge on the ability of their third and fourth line to contribute offensively. 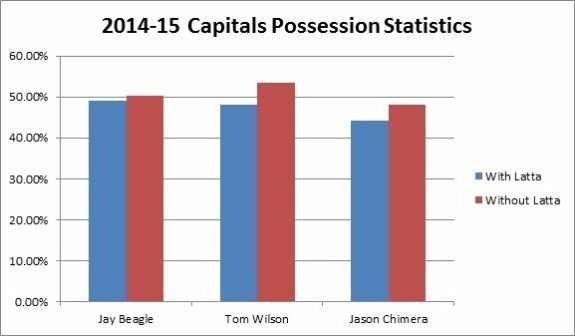 The Capitals will require help from their bottom-six forwards, including Jay Beagle, Tom Wilson, Brooks Laich and Jason Chimera. Another expected returnee at the forward position in D.C. is Michael Latta, who will play in his third NHL season in 2015-16 as he’s set to hit restricted free agency next summer. The former Nashville Predators draftee played in the NHL with regularity for the first time last season, playing in 53 games after appearing in 17 with the Caps under former head coach Adam Oates the prior year. He totaled just six assists. This came while playing extremely limited minutes, averaging 8:22 TOI per contest. He posted a 47.8 percent clip in the faceoff dot in 175 attempts, but will enter camp with the hope of becoming Washington’s fourth-line center in the upcoming year. The battle’s result could be dependent on the role of Beagle, who re-signed with the Capitals earlier this summer. Latta posted reasonable results in terms of puck possession for his role, first on the Capitals, earning 52.4 percent of the shots during five-on-five play last year for forwards starting in the offensive zone less than 35 percent of the time, according to puckalytics.com. In terms of NHL forwards with the same criteria, Latta ranked 71st out of 300 forwards. Although the possession stats are nice, Latta has one goal in 70 career NHL games. While being able to play on the penalty kill and add a physical game to the Caps lineup, at some point very soon Latta needs to show he can score goals and become more than a below-average fourth-line player if he is going to stay in the league. Another interesting note found via Japers Rink of SB Nation was that no Caps forward who played at least 18 games allowed high danger scoring chances at a lower rate than Latta. He’ll be another fourth-line option for Washington in all likelihood, but I think there’s room for increased performance. Although the Capitals lost quality forward Joel Ward to the San Jose Sharks, Washington offers more depth in their bottom six. Marcus Johansson could find a spot on their third line or even another forward could drop into a limited ice time role, not because of their ability, but rather the acumen of their teammates. A very reasonable possibility is Latta playing alongside Chimera and Beagle on Washington’s fourth line. Above is a chart of Latta’s most common linemates from last season, with all of the listed forwards improving their corsi-for percentage when they played apart from Latta, according to Hockey Analysis. Michael Latta dropped around 10-15 pounds this summer, working on his speed. Said his goal is never being out of the lineup this season. Latta needs to get more shots on net and become a better possession player with similar players to become a regular at the NHL level. Right now, he’s a marginal fourth liner who’s tendency to fight will be irrelevant in today’s NHL very soon. Improving skating is another area for a player in Barry Trotz’s system to improve on. Latta should aim for an increase in ice time like any other player would want, but Trotz needs to rely on Latta and trust him in order to put him out there in important minutes for a contending team in the 2015-16 campaign. This is a big year for the Caps and for young players like Latta, as well.